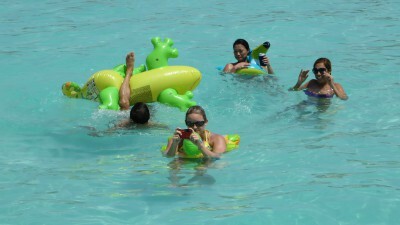 Our Cancun trip was starting off so well: pool time, boat trips, great company and wonderful (but super hot) weather. How could it get better? How about yachts, personal barbecues and a gecko named Gary? Yeah, it’s covered. I’ve got your boat right here. The weekend we spent in Cancun was so full of fun activities, I’m not sure where to start. Probably best to begin with my headache the morning after the boat tour at Xoximilco. Normally I’m not a big drinker of tequila, but the night before when the El Jimador was flowing fast and loose, I too was partaking of some of those shots, and the next morning my head painfully reminded me this wasn’t a normal occurrence. It wasn’t a splitting headache, more like a painful, niggling little reminder that that was not my brightest decision. Point taken. After breakfast that day, Sean and I hung out a bit in the room, we were going to Lidia’s in the early afternoon for a barbecue pool party at her new apartment complex, then changed into swimsuits for the pool before loading into a taxi with the group. 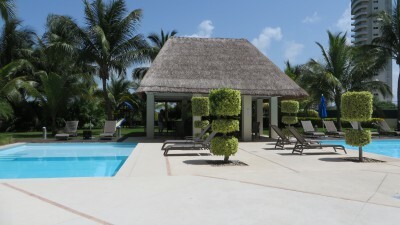 Our two pools and cabana where we wiled away the hours. On our way we stopped at this magical upscale grocery store called Superama, which it turns out, is owned by Wal-Mart! Let me tell you, Superama is on a whole other level from Wal-Mart – if I hadn’t seen it on the sign, I never would have believed it myself. After we’d stocked up on more sunscreen, drinks and snacks for the barbecue we got to Lidia’s and got a tour of her great new place. The same chef she’d employed last year was at it again and everyone was excited. Last year, his grilled corn and cactus were legendary. In no time at all, more of Lidia’s friends showed up, and one brought along a bunch of blow up pool floats: a toucan, a monkey and… Gary the Gecko. Gary became the star of the weekend (partly because he was so big and partly because he was so hard to get onto in the first place). All afternoon we floated in the pool, munched on fresh guacamole and pico de gallo, ate delicious grilled corn, cactus, flank steak and sausage and had a great time. Relaxing is an understatement and in the blink of an eye, the sun was down and the bugs were biting. Finally we called it a night and everyone headed out, knowing we’d see Lidia and Jeremy bright and early the next morning at the marina near the hotel where Jeremy’d been kind enough to charter a yacht to take everyone out to Isla Mujeres for the afternoon. That was gonna be awesome! 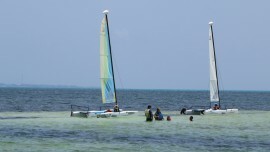 These people were out in the middle of the ocean, but the water was still only waist deep and crystal clear. 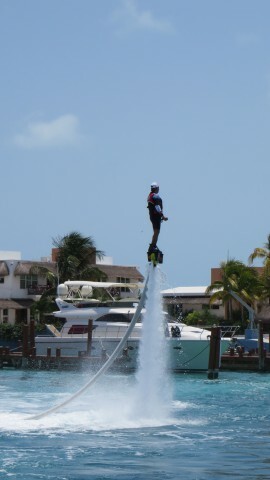 We saw a number of these guys flying around on their water boards. Very cool! At the crack of 10:30 the next morning, Jeremy arrived at the Westin and ferried us all over to the marina, less than a five-minute car ride from the hotel. The business providing the yacht, was called the Yacht Charter Club, and I couldn’t recommend it highly enough if you ever want to charter one for an afternoon. 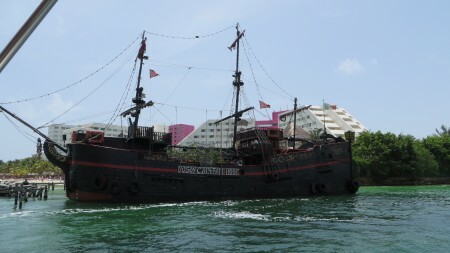 The owner was the nicest guy (originally from Chicago) and told us about his operations in Mexico and also Dubai (wow), and bid us a personal bon voyage. Our boat was dubbed Liquidity (I think we should have gotten the one named, Tequila, but oh well), and she was beautiful. Our group of 13 had plenty of room to spread out on the bow or under the shade on the back of the boat, and the entire time we were on the water the first mate, Tony, was bringing up drinks and snacks for us while our captain, Don Julio, set a course for Isla Mujeres. 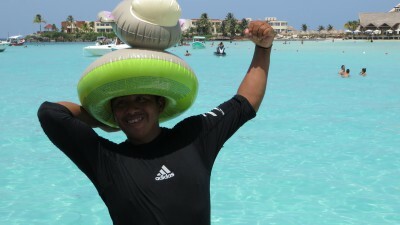 Even Liquidity’s first-mate Tony got in on the fun action at Isla Mujeres with his inflatable monkey hat. Halfway there, we anchored off and the snorkel masks and fins came out. While it wasn’t quite like Buccoo Reef in Trinidad, the reefs and fish we did get to see were pretty incredible. There were hundreds of thousands of them sometimes right below us. The only sticking point was the fact that we all had to wear life vests (which no one was thrilled about), but Don Julio wouldn’t budge on that one. Still, it was an amazing site. After everyone had ingested enough saltwater, we piled back on to the boat and made our way to the sandy beaches of Isla Mujeres. Just as in years past, we all ended up playing catch, drinking and generally lazing around in the water for the better part of the afternoon, until finally my skin started to feel tight and I knew I’d pushed my luck in the sun department. I wasn’t the only one either… As we headed back to the marina some sun worshippers rode at the front of the boat again instead of in the shade and regretted it later. But more on that in a bit. That’s Gary the Gecko there, upside down. Once we were back to marina, we all beelined for the hotel – the only thing on my mind was a shower to get the salt and sunscreen off. The plan after, since everyone was understandably tired, was a low key dinner at a taco place Adam had been telling us about since we’d arrived. Before dinner a few of us gathered to have drinks and take pictures of the sunset over the lagoon, and the damage done by the sun began to set in… When I say some of us were looking red, that is an understatement. Adam had gotten it especially bad – so bad in fact, that he had to purchase some lidocaine-spiked after-sun ointment. Poor guy. Dinner was excellent at this little, out-of-the-way taco restaurant called, Taco Factory (highly original name, I agree). Turns out, what it lacked in name, its many tacos (and first round of free margaritas) more than made up for. I had a pork and steak taco, Sean had steak and chicken, and we were all blown away by how tasty they were. We even got some free entertainment in the form of an old man dancing to some music over the speaker system like there was no tomorrow. For an old guy he could really move too. 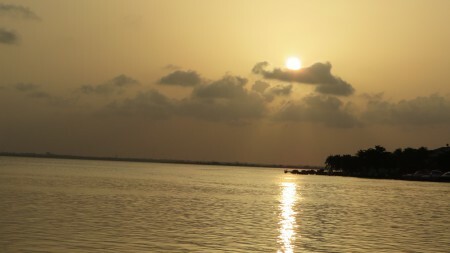 The most picturesque sunset at the lagoon. And with that, our weekend was done. With most of us having just one more full day in Cancun, it seemed like not much more could happen before our vacation was over, but man, was I wrong. Don’t miss this conclusion! This entry was posted in Mexico, North America and tagged barbecue, Beach, Boat, Cancun, Isla Mujeres, Mexico, North America, Pool, Tequila, Travels, Yacht on September 10, 2014 by Paige N..